In travel it’s not every day a special deal comes along, and you think “I’ve got to share this with the world!” but today is that day. Norwegian Cruise Line’s Free at Sea offer is a spectacular deal by itself, but it’s just been extended to include a unique Hawaiian itinerary on the Pride of America. In fact, there’s so much to tell you about this special vacation that we couldn’t fit it into one blog post. Come back in the following weeks to learn more. In this entry we will chronicle the specifics of the Free at Sea deal, and in our next blog entry we’ll explain the specifics of your island-hopping adventure. As travel agents we are always trying to educate folks about why they should book their cruise through a travel agent and not direct. The #1 reason being that there are hundreds of different itineraries that qualify for specific incentives, and some of them are truly one-of-a-kind, like this one. Every day we are looking at this information and crafting dream vacations for people just like you. Our experience can help you find the right cruise at the best price, and once we explain all the options and nuances, you’ll see why working with a travel agent gets you where you want to go, literally! So, let’s talk about this very special, one-of-a-kind Hawaiian cruise itinerary. It recently became eligible for specials that have never been offered at this destination. 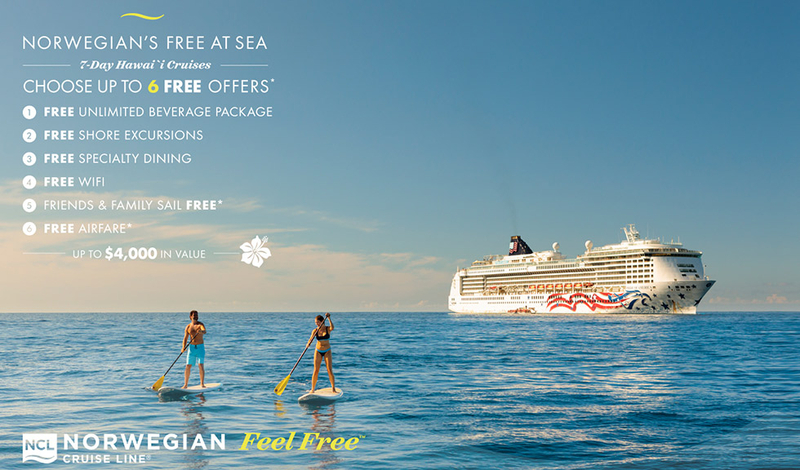 The Free at Sea offer includes six free amenities which are; unlimited beverage package (including non-alcoholic beverages), $50/port off shore excursions, free specialty dining, free Wi-Fi, family and friends sail free (select sailings), and free airfare (restrictions apply). There is no better deal out there! The sailing itself is aboard the Pride of America, which is a Norwegian Cruise Line vessel that sails only around four of the Hawaiian Islands. What makes the ship special is that it’s a US-flagged ship (meaning the ship is registered in the US). Most large cruise line ships are registered in a foreign country. If a ship is not flagged here in the US, then it’s required to visit a foreign port somewhere along the itinerary. Because the Pride of America is flagged in the US, it doesn’t carry this requirement, and can spend the entire time in Hawaii without having to leave the country. This also means that passengers on this vacation do not have to obtain a passport to take this particular cruise. This is a big bonus for those who don’t have a passport. Another thing that makes this cruise super special is that, because the ship visits only the Hawaiian Islands, there are no “at-sea” days, meaning there is much more time to spend on land enjoying the islands. The Pride of America is suited for this itinerary because it’s a smaller, more intimate ship. There might not be large water slides or rock-climbing walls, but the backdrop of the Hawaiian Islands makes up for this in spades. Also, the onboard entertainment and dining does not skimp. Onboard, there are six dining establishments that are regularly included in the fare. These include two dining rooms, a 50’s Diner, an Asian Fusion venue, a café, and a bar and grill. There are several specialty restaurants aboard that normally charge an extra fee, but these are included in your Free at Sea special when you choose the dining package. Several bars with creative themes are peppered around the ship, including the Mardi Gras night club and Pink’s Champagne Bar. The champagne bar is modeled after a famous Hawaiian hotel called the Royal Palace. Other entertainment onboard includes Broadway shows, arcade games, deck games, sports deck, theater, spa and shopping. We will be sharing more about this exciting and special itinerary over the next several weeks. Come back to learn more about the shore excursions offered in Hawaii, as well as insider info about the ship itself. Click Here to View Pride of America Cruises in Hawaii! *2018 NCL Corporation Ltd. Ships' registry: Bahamas and USA. *Free or reduced airfare on select cruises from select getaways. *Gratuities, specialty service charges and other restrictions may apply. River Cruising in Africa: Pyramids and Safaris Oh My! Dream Vacations TravelPerks is a travel agency specializing in providing SAVINGS • SERVICE • SATISFACTION with every cruise, resort or vacation package you book with us! Follow our blog to stay up-to-date with the latest happenings in the cruise industry and for great deals on cruises & resorts! Booking a Vacation is FUN! "In today’s environment, booking vacations is hard. Why? There are a million and one websites out there that all have information on them. You can look at peer reviews until you are blue in the face. Is this ship really that bad? Is it the best thing ever? Is the resort awesome? Was it an isolated incident? Who knows. And sorting through all of them and figuring out what is real and what is somebody making a mountain out of a mole hill takes time. Which is where Theresa comes in. We love working with her for our vacations. It generally involves a quick phone call giving her a budget and the vibe we are looking for. And then go on an awesome vacation. No pecking through reviews and pricing that should be written in hieroglyphics. Just straight up advice and no nonsense planning. Prior to using Theresa’s team, I would spend hours planning and routing and reading. Now? I pick the phone up or I email the awesome team and they take care of me and we get to enjoy our vacation. If you are booking a large group or an intimate vacation, I highly recommend Theresa and her team. Awesome to do business with and they make vacations FUN!" "We've never had a single problem with the people or the bookings at TravelPerks. I talked with someone in the shuttle to LAX and their holiday was a booking disaster so I gave them your web address with high recommendations.."